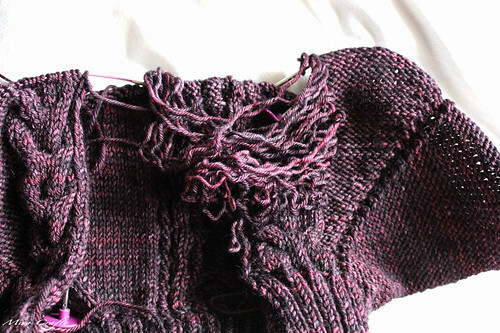 Miso Crafty Knits: I'm scared! OK, after doing some thinking I knew that the inevitable was going to have to happen. I was going to have to rip back the cable some way or another and fix that mis-crossed section. I did some Google-ing and read up on what others have done. I knew for certain that I didn't want to have to rip back the entire thing for that one wrong row. That would have some serious detrimental consequences to my knitting mojo. Then I remembered reading a loooong time ago a post by the Yarn Harlot about my very same predicament. A quick search and sure enough, there it was. The post that will save my project...and my sanity. You can read her post here. Oh Yarn Harlot! How I love thee! !